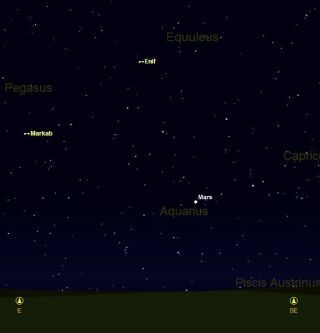 SKY MAP: The meteors will emanate from a point in the sky near Mars. This view is from mid-northern latitudes at 4:30 a.m. local time this week. Several meteors per hour will grace the skies for many viewers Thursday and Friday morning, May 5 and 6. The annual eta Aquarid shower is not among the best, but it can put on a good display in the early morning hours. Astronomers expect 5 to 10 meteors every hour in the United States and up to one per minute in South America and Australia for viewers with dark skies away from urban and suburban lights. City dwellers will see much lower counts. Meteor showers tend to be best viewed in the predawn hours when the side of Earth you stand on is plowing into the space through which Earth orbits. Like a car's windshield, the air there is well positioned to catch meteors. In the evening, you are on the trailing edge of the planet where not as many meteors are scooped up by the atmosphere above you. The eta Aquarids are named for the fact that they emanate from the constellation Aquarius. Though the shooting stars can appear anywhere in the sky, each one traced backward will lead to the radiant point in Aquarius. The meteors of this shower are caused by bits of debris, most no larger than a sand grain, left behind during the orbital trek around the Sun of Halley's comet. Each year Earth passes through the debris stream as if wading through a river of space dust. The meteoroids vaporize during their plunge through the atmosphere. Halley's comet returns to the inner solar system every 76 years. Meteor watching experts advise going out well before daybreak. Find a dark spot away from porch lights and other sources of illumination. Seek a location with a wide-open view of the sky, especially the eastern horizon. Allow 15 minutes or so for your eyes to adjust to the darkness, then recline on a lounge chair or blanket and scan as much of the sky as possible. The eta Aquarids are known for producing dramatic Earth-grazing meteors for U.S. viewers, because the shower's radiant from the states is low on the horizon. Earthgrazers skim the horizon in long, relatively ponderous displays. They are best seen between 2 a.m. and 2:30 a.m. local time, according to the NASA-sponsored web site Spaceweather.com.